By Hazel Chua on 11/19/14 • Leave a comment! Anyone who has tried to dial or type with freezing fingers knows that the task is futile, or extremely time-consuming at best. You can get gloves with capacitive patches on the fingers so you can still use your phone when you’ve got them on, or you can get the Embercase and do away with the gloves. The Embercase is designed to keep your iPhone safe from the elements while doubling as a hand warmer to keep your hands warm and toasty. It connects to your mobile device via Bluetooth so you can control its temperature via a companion app. 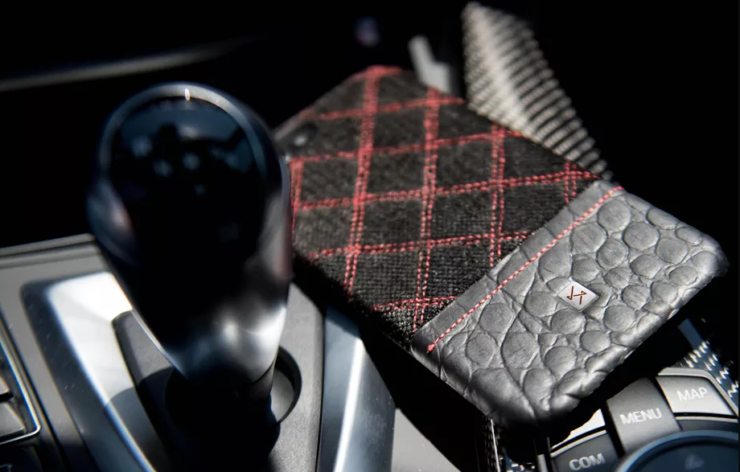 You don’t have to worry about stuff overheating, as the case is made from titanium with a layer of Aerogel ceramic fiber to insulate your iPhone from the heat. Where’s that moisturizer when you need it the most? Winter is coming, and the cold air can be harsh on skin. Seeing as most people don’t leave home without their phones (and their power banks! ), Thanko’s mobile battery seems like a smart solution to low power and dry skin. 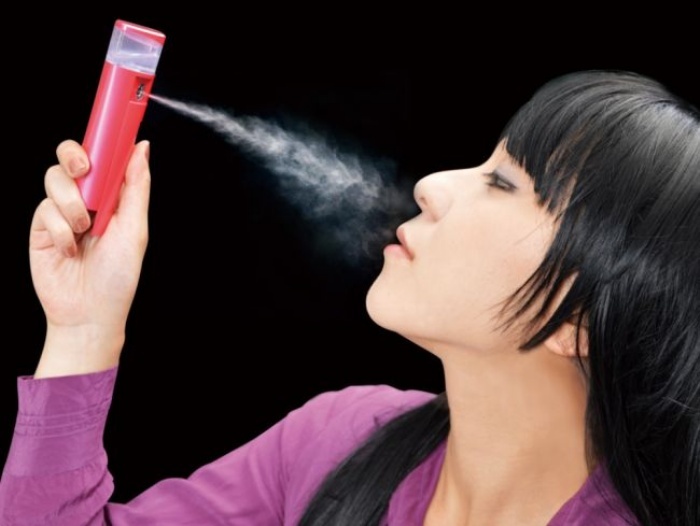 Aside from being a portable power source, it comes with a built-in spray that keeps dry skin at bay. Well, that’s what we’re wondering, too. 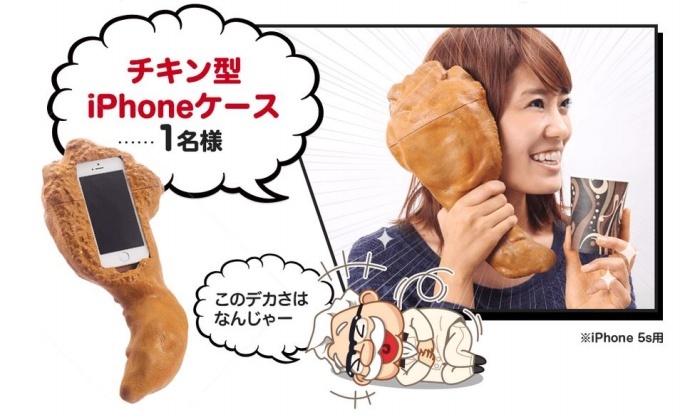 The only way to get one of the cases was to win it from KFC Japan. Dang, that’s a huge case. Ironically, it’s making me not want to eat chicken after looking at it. If you don’t have the time or energy to make one of these Game of Thrones-inspired phone stands, then you can just fork 25 bucks over and be done with it. 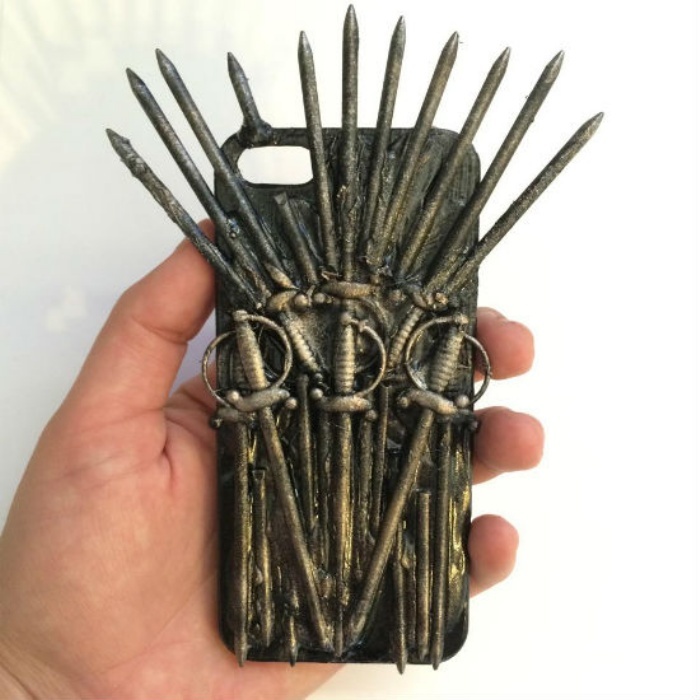 These Iron Throne phone cases are handmade and covered with mini swords and other sharp things all over–in short, just how it should look, seeing as it’s based on the iron throne. Cases for the iPhone 4, 4S and 5 are available, although more cases compatible with other phone versions are in the works. By Hazel Chua on 06/30/14 • Leave a comment! What’s better than a case that sufficiently protects your phone from cracks when you accidentally drop it? Why, an interactive one like the Equalizer Case, that’s what! 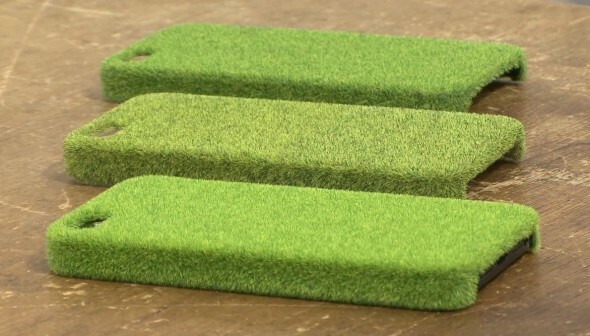 It’s made from tough polycarbonate plastic to provide an added barrier between your phone and whatever hard surface you might bump or drop your phone on. What sets it apart from other cases is the glowing display on its back that looks like a graphic equalizer. The coolest part? It reacts to ambient sound or music, so the levels go up or down, depending on the current sounds around it–like, say, the sound of your voice when you’re taking a call or the tunes when someone’s playing music. It uses its own battery, so you don’t have to worry about it draining your phone’s power, and has an on/off switch in case you need to tone things down. 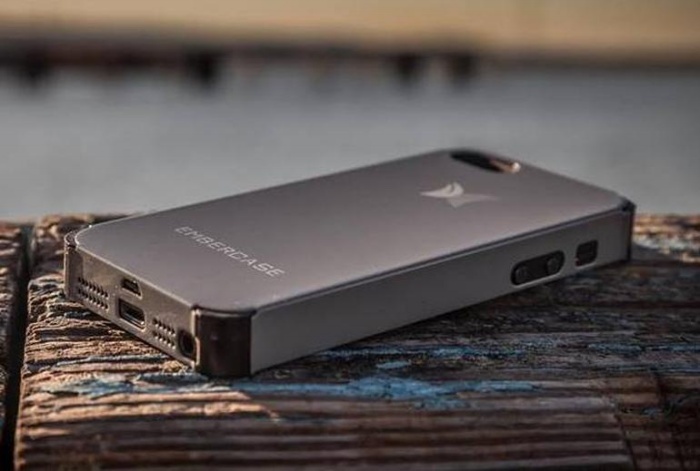 The Backpacker phone case has a lot of things going for it, with the exception of being sleek or thin because it’s neither of those. 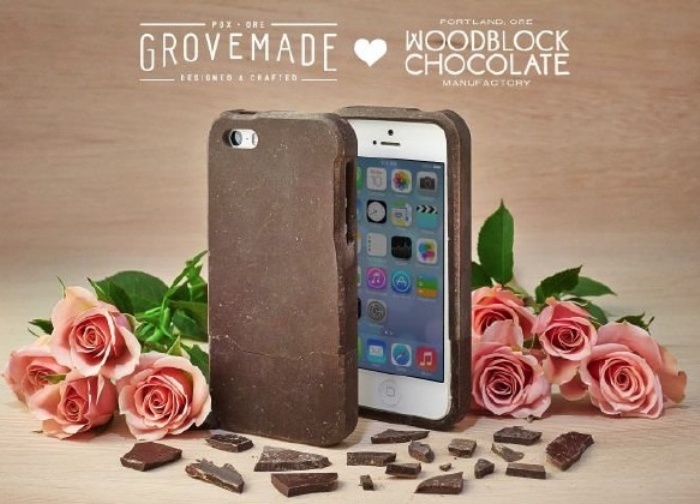 Rather, the case makes your phone look like the hunchback of iPhone-dame (sorry, couldn’t resist! ), but that hump right there is where all its extra functionality lies. For starters, you can pull it out to turn the case into a stand for your phone. 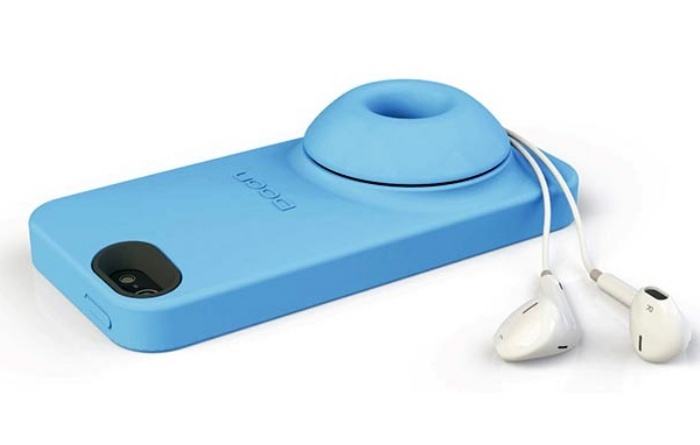 At the same time, it serves as an amplifier to give your phone’s speaker that extra boost. Lastly, you can push it back to its dome form and roll your earphones to store it and get them out of the way.